"You don't need a special 'gift' to read tarot," insists Josephine Ellershaw. And to prove it, she has boiled down thirty years of experience into a straightforward, easy-to-use tarot guide for beginners. More than just a manual, Easy Tarot is a boxed kit that also includes The Gilded Tarot, a stunningly beautiful and popular deck by the well known Ciro Marchetti. Using the beautiful Gilded Tarot deck, you'll learn how the seventy-eight cards link to one another and provide insight as their unique energies merge in the Cross of Truth, the Celtic Cross, and other spreads. There is even a list of Tarot card combinations that commonly indicate specific events-such as pregnancy, a wedding, a new job, and more. • Troubleshooting advice for questions such as, "What if the cards don't seem to connect?" English, French, Russian, Portuguese, Chinese, and Danish. "Take Your Tarot Readings to the Next Level"
Easy Tarot Reading continues straight on from Easy Tarot, taking theory into practice. Foreword by award-winning Tarot author Barbara Moore. After learning Tarot card meanings and basic spreads, the next step for beginners is fitting all these pieces into a cohesive, insightful reading. 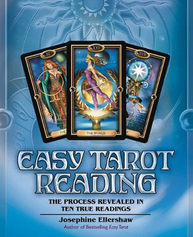 Josephine Ellershaw, the author of the international bestseller Easy Tarot, presents an easy, effective, and enjoyable way for anyone to learn to do amazingly accurate, helpful Tarot readings. Ellershaw illuminates the Tarot reading process by inviting you to virtually sit in on her readings with ten individuals. 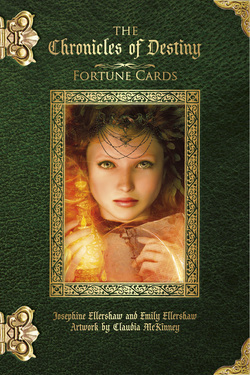 Card by card, spread by spread, she reveals her thought process behind each interpretation and decision, and tells how to make the connections that add clarity and depth to a reading. These compelling and memorable accounts of ten very different readings, along with follow-up documentation of how relevant each reading proved to be, result in a powerful and completely unique approach to learning to do Tarot readings. Available in bookshops, Llewellyn, Amazon, or Wordery. Paperback and Kindle. From ancient times, storytelling has been an engaging method to impart ageless wisdom through underlying meanings and morals of treasured tales. Step into the magical Enchanted Emporium and, through the Guardian of Books, work with 60 beautiful fortune cards to find adventure, immediate insight, and guidance as you interact with an original, themed story. During your quest for answers to your most important questions, receive step-by-step instructions, keywords, in-depth meanings, exciting spreads, a timing method, cheat sheet, card combinations, and sample readings in an accompanying guidebook. No previous knowledge necessary, and this deck and guide is also suitable for more experienced users. What will your destiny reveal? Discover your destiny with immediate insight and guidance. 60 gilt-edged cards, featuring the artwork of Claudia McKinney. Full colour book containing step by step instructions. Includes, keywords, in-depth meanings, spreads, timing methods, cheat sheets, card combinations, and sample readings. Beautiful hardcover box with ribbon hinges and magnetic closure for safe storage. Easy to use and suitable for all levels. You can find out more and read the reviews on our Chronicles website, and available to purchase from Schiffer Books, Amazon, or Wordery.